Decisions and actions based on "should" are likely to set you on a course of pursuing dreams that are not yours, of making decisions that eventually backfire, and in the end have the potential to create a pile of regrets when you realize you've been living life by another person's good ideas and not your own. 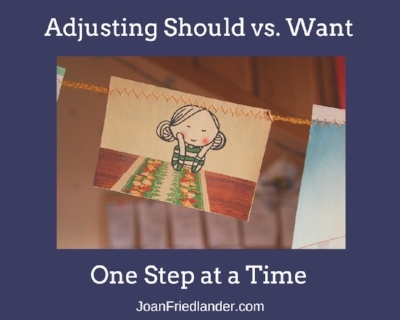 Below are 5 ways that you can adjust the should/want scales if you notice yourself weighing in more heavily on the "should" side of the scale with some frequency. 1. When you notice "should" coming out of your mouth or silently into your head, take a moment and ask, "What do I want?" or "Is this what I want?" If you've been unaware of your should statements, this simple step will illuminate the thoughts and feelings that have been running the show, giving you an opportunity to begin to determine what is correct and true for you. 2. Experiment with smaller wants, meaning those that, in the face of a should, you perceive as less threatening to your survival. Do you want to skip dinner and go straight to dessert? Would you like to take the afternoon off, just because? Is a mid-morning nap calling your name? Do you want to stay inside all day in your sleep clothing playing with your kids? 3. Try moving around. If you get caught in the emotional quicksand of "Should I or shouldn't I?" Take a 20-minute walk, engage in your favorite exercise or take a shower. Movement can get you out of your head and back into your body, where real wisdom resides. 4. Seek out sayings, affirmations or books that help you align with your inner guidance system and gain the courage to start experimenting with it. 5. If you find that you are significantly uncomfortable about what you discover you want, so much so that you are frozen in inaction, consider asking a trusted adviser, counselor or friend to help you discern and hear your inner wisdom.